Four years ago, Sophie moved into a shiny and brand new place (also known as a WordPress domain) she decided to call Sweet n’raw. For three whole years, it was a perfect match, Sophie wore every trend and countless outfits of the day. Each season, Sophie made runway specials, summer bibles and Christmas gift guides. For her, it was all about keeping up with what was new and current, it was all about posting that magazine cover or that ad campaign before everyone else. It was fun, it was also a lot of work but in the end, she felt it just wasn’t enough. After a while and in the words of the very talented Peggy Lee, Sophie asked herself one question: “Is that all there is?”. Then and there she knew it was time to move on, it was time to move out, it was time to be a part of something bigger. She packed her bags, she closed up shop and took the first step towards a new and magical journey. The transformation started and Sophie began working on an untitled project, her masterpiece (you’ll soon see why). A year later, with her “project with a fabulous title” in the oven and almost fully baked, Sophie decided it was time to blog again. 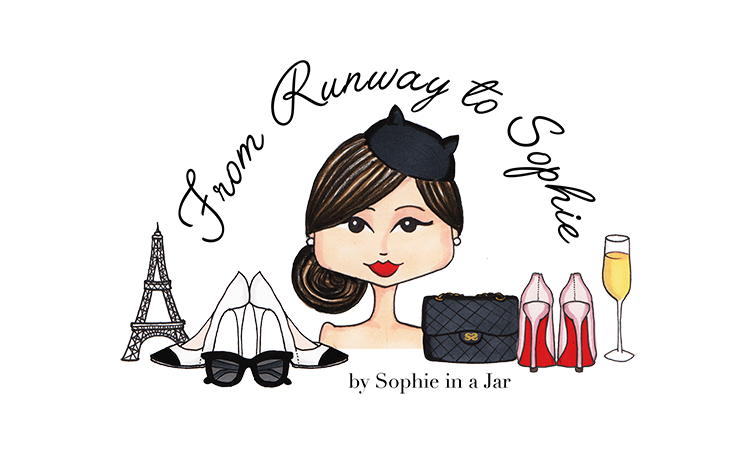 From a new home, with a new name, from a new perspective and with a fresh voice, meet From Runway to Sophie. This time, it’s not about keeping up with the industry and the trends, it’s more about Sophie’s take on fashion, her favorite designers, shoes that make her feel weak in the knees, past collections that made her swoon, current ones that make her go “ooh”. And you know how it goes, right? What Sophie likes, Sophie wears, no shopping required. After all, with a pair of markers and a bleedproof pad, she can be wearing that pink Prada dress that hasn’t even hit the runway. Welcome to Sophie’s fashion archives, welcome to From Runway to Sophie!